Home What Are Scale Modes? No single musical topic generates more curiosity and utter confusion than scale modes. The real purpose and point to the modal concept eludes most guitar players. Available instruction on modes is often incomplete and misleading. Why Do Guitar Modes Matter? Before I get into the details of modes, I want to first explain why knowing modes matters. One of the biggest mistakes guitar players make is to assume that the modal concept is just a theoretical idea that doesn’t really have a practical purpose, but this is not true. Most music is modally based in one way or another. Recognizing modes is critical to understanding how music works and the different tonalities produced by the major scale. Chord progressions, melodies, harmonies, riffs, lead guitar solos, and bass lines are all derived from modal scales in some fashion. Each modal scale has a distinct tonality. Understanding the modal concept is absolutely necessary if you want to become a knowledgeable composer and versatile player. In a nutshell, here’s how modes work… The major scale has seven notes, and any one of them can be used as the starting point, or the primary pitch, of a piece of music. In other words, you don’t always have to base music off of the first degree and chord of the major scale. The sound of the scale changes depending on which degree is primary. For example, when you play the G major scale in a manner that centers on G, you hear the typical major scale sound, which is also known as Ionian mode. But if you compose a piece of music to center on the second scale degree, A, and the second chord, Am, you produce the jazzy minor sound known as Dorian mode. In this example, your ear hears the note A as the tonal center of the music, and then everything else in relation to it. Santana’s “Oye Como Va” uses this trick. It uses chords ii and V out of the G scale, Am7-D9, with the Am7 functioning as the primary tonic chord. Something important to point out in the previous example is that you don’t need to learn new scale patterns in order to produce a modal sound like Dorian mode. Instead, the mode is made by how you apply the notes and chords of the major scale. If you’re looking to play modes by learning new patterns, then you’re missing the point. As the neck diagrams below illustrate, the very same notes that make the G major scale are used to play in Dorian mode. 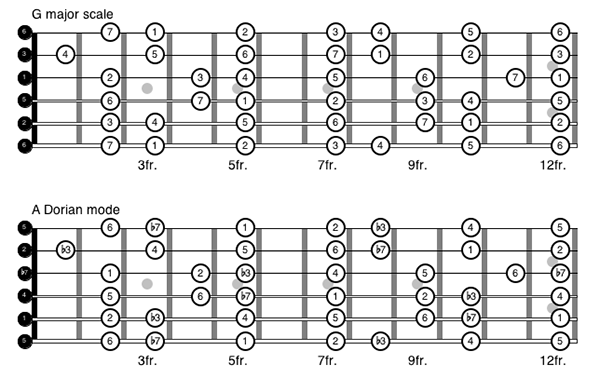 The only difference is that in Dorian mode the focus of the music is the second degree, A, not the first degree, G.
Both diagrams above illustrate the same G major scale notes on the fretboard. Since “Oye Como Va” centers on the 2nd degree, A, most musicians would count the A as “1” and call the scale, A Dorian mode. You can’t fully produce the sound of Dorian mode by simply playing the notes of G from A to A. Instead, you need to play the notes over accompaniment that centers on the second degree of the G scale. The modal concept is one of tonal centers and harmony, not necessarily starting positions. The following audio track, which features various grooves and progressions played in the style of popular A Dorian mode songs, has chord changes and bass lines drawn from the G major scale, but with the music always centering on the 2nd scale degree, A, and the second chord, Am. 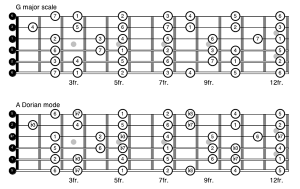 Play along using notes from the G major scale in any position and any pattern (referring to the diagrams above if need be) to hear the sound of A Dorian mode. Remember that as you play notes from the G scale, your primary note is actually A. There are seven major scale degrees and seven possible music modes, each with a special Greek name: Ionian, Dorian, Phrygian, Lydian, Mixolydian, Aeolian, and Locrian. Each mode has a unique structure and sound. You get to know modes by applying major scale patterns to modal chord progressions and playing familiar modal songs. In music, some topics necessitate prior knowledge of other topics. The concept of modes is really a combination of other, more fundamental concepts. Specifically, modes are based on major scale patterns and chord progressions, so you need to learn these topics first, otherwise you’re getting ahead of yourself. Make sure that you can cover the neck with major scales, build chords, put together chord progressions, play by numbers, and apply pentatonic and major scale patterns, then you can explore modes. Would you like to learn more about music theory for guitar so that you can have a better understanding of how to play and compose songs? Studying theory will uncover the mysteries of music and help you more quickly develop your skills as a guitarist, songwriter, improviser, and composer. 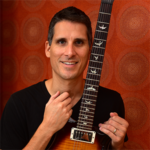 Sign up to receive my FREE 6-step email course, “Bedrock Guitar Theory of the Pros”, and discover the 6 simple concepts that will have you rockin’ guitar music like a pro in half the time of ordinary lessons.